It took me ages to get this picture! 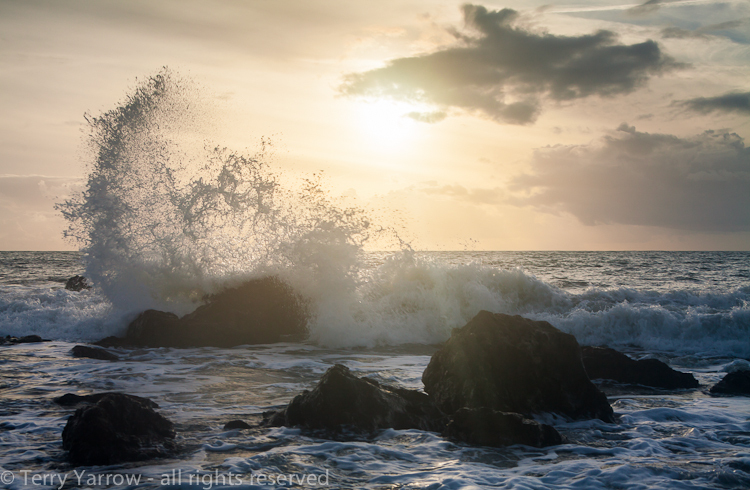 There were huge waves rolling in and I had my camera focussed on this rock just waiting for an almighty splash, silhouetted against the sunset………and they all just fizzled out like damp fireworks. Every big wave which promised so much in the end was found wanting as it failed to deliver. In the end I took my camera down – well my arms were aching 😉 – as I could only see this tiny ripple heading towards the shore. And yet that insignificant wave created this huge splash. Fortunately I managed to get my camera up again and grab the shot just in time, and I could go home satisfied :)! Next Of empirically English seaside sights and sounds! Just stumbled on your blog, as fellow Dorset walkers/strollers/enjoyers of this great county, I will continue to keep an eye on your visits too. Lovely blog and photos.